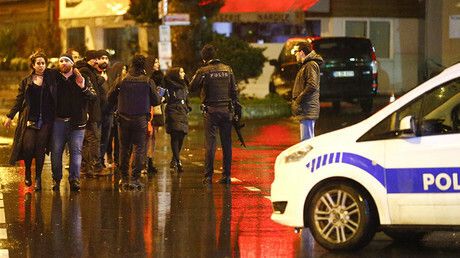 Some 39 people, including 15 foreigners, were killed and 69 injured when at least one gunman reportedly dressed as Santa opened fire in an Istanbul night club. The manhunt for one terror suspect is underway. Turkey’s interior minister, Suleyman Soylu, told Turkish media on Sunday morning that 21 victims have been identified so far, of whom 15 were foreign nationals and five Turkish citizens. Soylu said that the shooter is still at large. “The search operation for the terrorist is ongoing,” the minister said. Conflicting reports have put the number of gunmen at one or two. 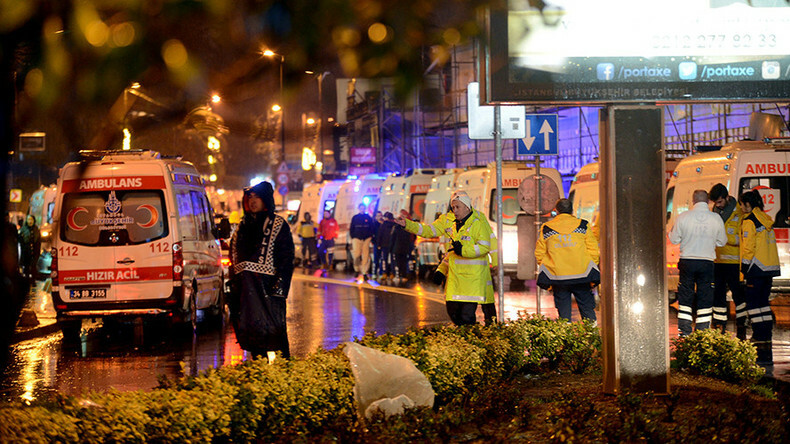 Immediately after the attack, Istanbul’s governor Vasip Şahin said that 35 people had been killed and 40 wounded, calling the incident a terrorist attack. The Guardian also cited “government officials” as saying that the attacker was killed and police were leaving the scene. The attack took place at the well-known Reina nightclub in the Ortakoy neighborhood, in Istanbul’s Besiktas district. "A terrorist with a long-range weapon... brutally and savagely carried out this incident by firing bullets at innocent people who were there solely to celebrate the New Year and have fun," Sahin told media at the scene of the attack. Şahin said that the assailant first killed the police officer who was standing at the door of the club and then went on a rampage inside, killing innocent civilians. Eyewitnesses said that the attacker was speaking Arabic, Turkish media are reporting. The gunman was dressed in a Santa Claus outfit, wielding an assault rifle, some Turkish media said. Attackers w kaleshnikovs reportedly still inside famous #Reina club. The attacker opened fire on clubgoers, injuring at least 20-30, according to NTV. The number of casualties may rise, as it is estimated that between 700 and 800 people could have been in the club at the time, Mynet Haber reports. Some club-goers jumped into the sea in panic as the attack unfolded, Turkish media cited eyewitnesses as saying. They were rescued by police, according to Euronews. While officials now are talking about just one suspect, media alleged earlier that one of the gunmen had hidden inside the club, while the whereabouts of the second was unclear. Turkish President Recep Tayyip Erdogan has been informed of the terrorist attack and is being updated on the latest developments, CNN Turk reports. Messages of condolence have been pouring in for Turkey in the aftermath of the attack. “Our thoughts are with victims and their loved ones. We continue to work to prevent these tragedies,” EU foreign policy chief Federica Mogherini published in Twitter message. Apple’s CEO Tim Cook extended his condolences to the Turkish people in another Twitter post, this one penned in Turkish. “Dear Turkey, we share your pain and sorrow. Istanbul, our heart is with you,” the message read.